You turn the key and the engine goes vroom. That’s how you start a car. In the more than 10 years since I started driving, there have been a lot of change in cars. I’ve seen the addition of safety features like airbags and antilock brakes. Once luxury items like air conditioning and keyless entry have become standard on all but the lowest-end models. Navigation systems and speech recognition have become available. But starting the car has been the same. The key itself looks like the fobs that most cars have. The start/stop button that takes the place of the keyhole. The fact that you don’t have to have the key in the ignition also makes stopping and parking tricky. I parked, walked out of the car, locked the doors and went into the office. When I returned at the end of the day, the car was still running. Because the car is silent when in electric mode, I didn’t realize the car was still on when I parked. (Hybrid cars also present a problem for blind pedestrians at intersections, because they can’t hear them coming.) I still don’t know whether someone could’ve driven off with the car during the day. Keeping track of the key is also fun. Unlike other cars with the fancy keys, the Altima seems to require that you press a button to unlock the door. You can’t just keep the key in your pocket, grab the handle and have it open automatically like on the Prius. I could never remember if I put the key in my jacket pocket, jeans or in the console. There is a place to put the key in the dash, but it’s not where the ignition slot usually is. The valets at my hotel also seemed to have a hard time with the car. We couldn’t figure out why the trunk release wouldn’t work. It turns out that the car was still on (though silent) and there is an interlock that prevents the trunk from opening when the car is on. The interlock should really be tied to whether the car is in park. It’s probably not fair to judge these features based on my experience as a casual user for a week. If I owned the car, I’d certainly get used to these quirks and would likely come to appreciate them. But with such a radical departure from a long held user experience, there need to be design elements to ease the transition. I certainly don’t want a repeat of “the door is ajar” from the K-Car of the 80s, but some sort of reminder that this dummy left the car on would be nice. 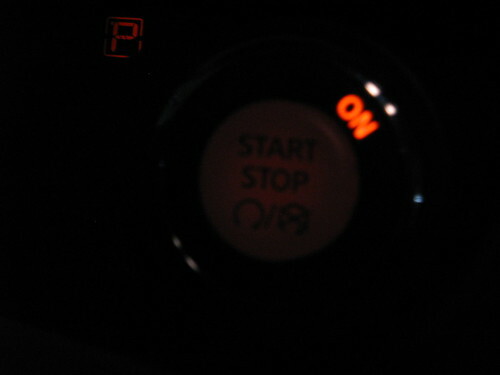 Or an ignition cutoff if the key is removed from the car for more than 15 minutes. This entry was posted in fun, random, usability. Bookmark the permalink. Click and Clack had something about whether leaving the electronic car running could have meant potentially killing someone (with slow seepage of fumes, I guess). But that doesn’t address the issue of whether the car could have been driven off because it was left on.